Don’t be surprised this year if your clients want to brighten things up a little and add some eye-popping brights to their home decor. When times are tough we could all do with a bit of cheering up, which may be why Pantone’s announcement that Tangerine Tango is their 2012 colour of the year has got everyone smiling and posting images in citrus shades. From fashion to handbags to kettles, orange rocks, the question is how do you successfully incorporate or suggest it for a decorating scheme? Hallways are a perfect location in the home to opt for some colour, there’s little soft furnishing to co-ordinate or furniture to ‘match’ to. 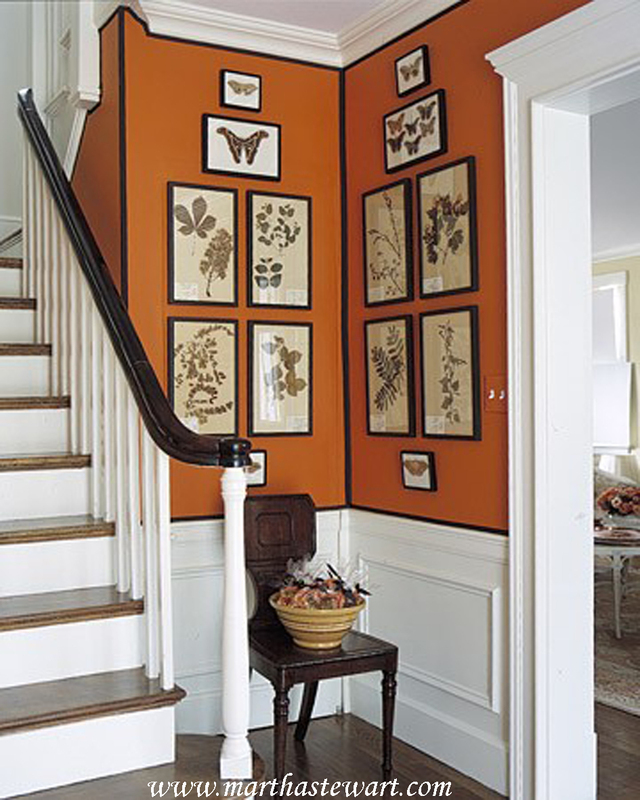 This orange hallway on the Martha Stewart web-site manages to be both fun and elegant, quite an achievement and proves it can be done. Tangerine works well with white or warm creams but can also give personality to a room full of earth tones like this dining room, which could be accused of being a bit dull without it’s fruity walls. Clients who’ve used super trendy grey in their home decor will find that orange is a fabulous accent colour, whether used in stripes, blocking or whole walls. Will over at Bright.Bazaar has some more ideas over on his brilliant blog. Use a tester card first to get the best shade matches. Don’t forget it’s not just walls you can paint! Virtually anything can be brought bang up to date using the correct paint finish. 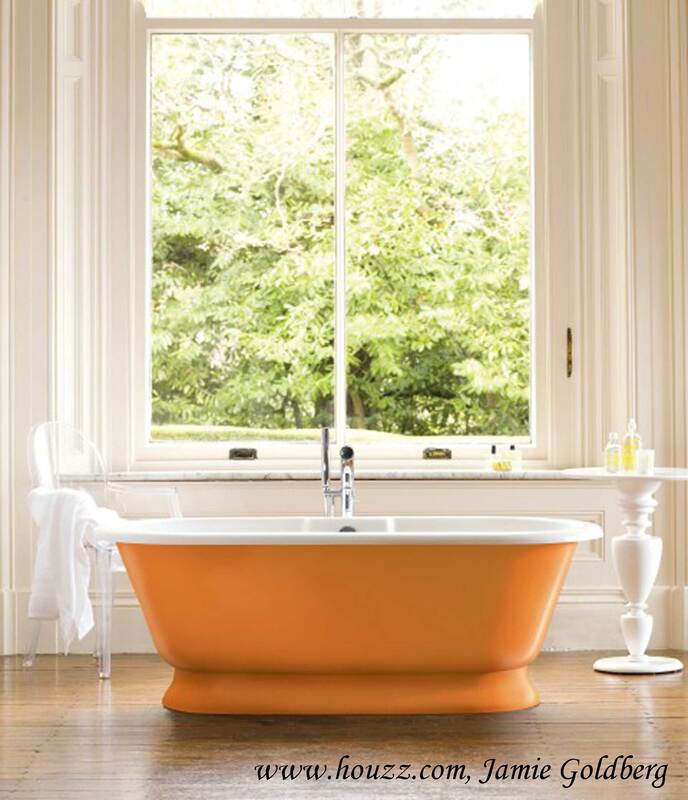 I love the way this period style bath has been given a fresh zesty twist. 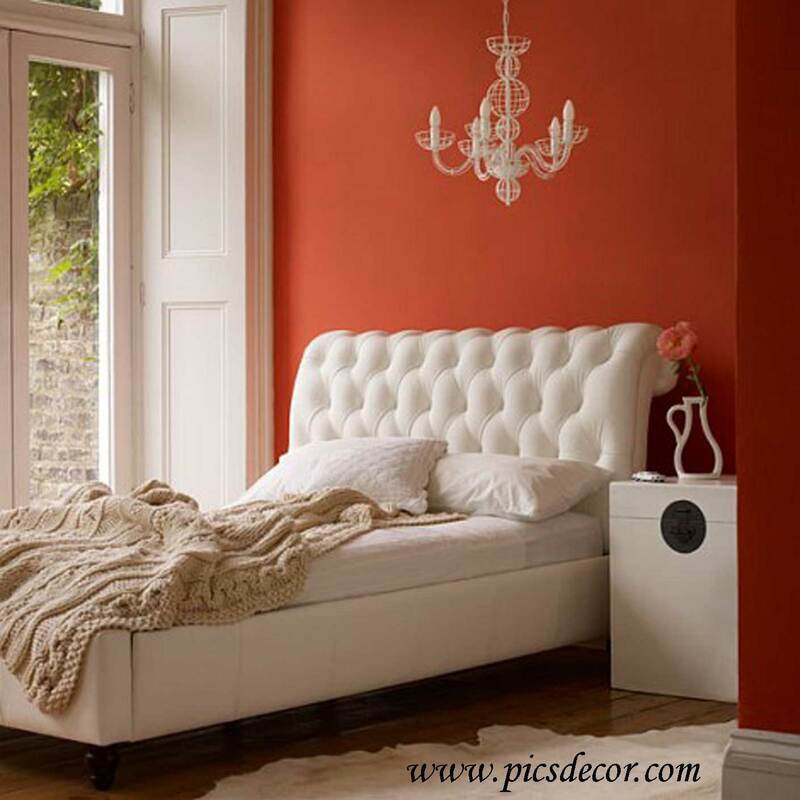 If Tangerine Tango is just too much for your clients but they still want an element of the look, suggest they tone down the shade for a more subtle and elegant style. This bedroom feature wall colour couldn’t be called funky yet still seems to give a contemporary edge to very feminine furniture and lighting.